Ice Dams….what you need to know. It’s that time of year again! As snow freezes and thaws, you may experience ice dams building up in your gutters or on low-sloping roof areas. Unfortunately, this means that a blockage has been created and the water from the melting snow on your roof cannot flow from the gutters to the downspouts. This can potentially cause the water to back up under your shingles. Oftentimes if the melting snow, water and ice cannot move through your gutters unobstructed, it finds a way into your home, causing damage to your walls, ceilings or insulation. Typically there is minimal, if any, damage to the shingles on your roof. However, it may be necessary to pay a professional to remove snow or ice in the affected area to prevent any further damage. As your policy requires you to mitigate damages, a reasonable cost to do so may be covered under your applicable building policy. In the event of a covered loss, be sure to work with your contractor and claim adjuster to determine a reasonable cost for this service, and always obtain an invoice to present for reimbursement (subject to your policy limits and deductible). •Keep your gutters and the areas near your downspouts clear so water is unobstructed when channeled away from your roof. •Consistently check your attic and the tops of exterior walls for moisture or water stains. •Safely remove excess snow and icicles from the edge of your roof, if possible. •Long-term prevention of ice dams includes proper insulation in your attic and applying an ice and water shield membrane under your shingles. Content originally posted here by Auto-Owners Insurance Company. 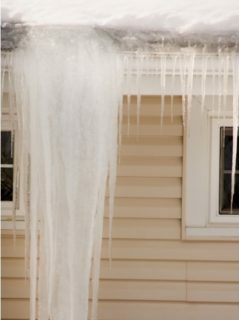 Posted in Blog | Comments Off on Ice Dams….what you need to know.